“Jurassic World,” the latest installment of the “Jurassic Park” film franchise, isn’t due out until June — but you don’t have to wait for that summer blockbuster to score face-time with dinosaurs. 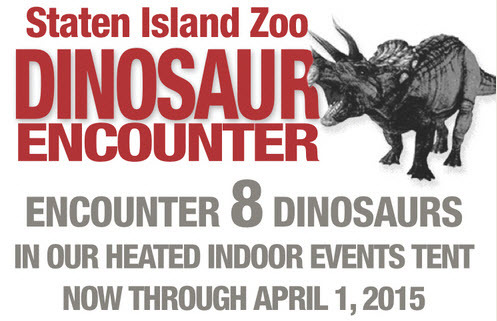 Eight of the scaly prehistoric creatures are wintering at the Staten Island Zoo, where “Dinosaur Encounters” debuted Thursday, Dec. 18. “They’re not real. They’re like toys,” said one of the adults shepherding the slowly moving wide-eyed tots as they arrived. “The combination of science and imagination, education and fun is something that Field Station shares with the Staten Island Zoo,” said Zoo executive director Ken Mitchell.